COLOR(S): Black or liver with roan, black or liver with white, or tricolored. The English Springer Spaniel is a medium-sized sporting dog with a neat, compact body and an unnaturally docked tail. In countries where docking is illegal, the tail is medium length. They are one of the largest of the Spaniels. Their coat is moderately long and glossy with feathering on their legs, ears, chest and brisket. They are leggy creatures, having the name "Springer" for good reason. They have drop ears that can sometimes get mud and other substances stuck in their dangly locks. Handsome and robust, they excel in the field by flushing out game. They are of even temper and are intelligent. Springers remain loyal to their masters, retrieving the prey with a soft mouth eagerly and faithfully. They are need much exercise, and are hardy workers. Although beautiful in appearance, the Springer Spaniel is no choice for a meticulously clean house; they enjoy a good shake inside the house when they are wet. The Springer is active well into his older years, and is outgoing and entertaining as well. They are enthusiastic and easygoing for adults, but may be too excitable for young children. They are friendly and fun with family and friends. English Springer Spaniels make an excellent family companion as well as a good working dog. They must have human companionship and the freedom to exercise regularly. English Springer Spaniels are willing, active, faithful, and intelligent. They are generally good with other pets and older children. 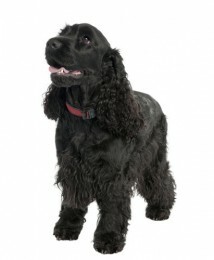 Springer Spaniels are good at working and eager, enthusiastic and fun. They love to be by their humans, and love to exercise. They are energetic, outgoing and friendly. They are generally easygoing in temperament, but may sometimes be foolhardy. They are affectionate with family and have a pleasant personality. An ideal gundog, they are loyal and reliable. Regular grooming of the English Springer Spaniel coat with a stiff bristle brush. Bathe only when necessary. Occasional trimming of ears and pads of the feet. It is recommended they receive professional grooming once or twice a year. It is important to check for mud that may have gotten lodged in the ears and between the toes, as the ears may be prone to infection. Usually sound and healthy. May have eye abnormalities, PRA (Progressive Retinal Atrophy) or ear infections. Other health concerns include enzyme deficiency, PFK (Phosphofructokinase deficiency), hip dysplasia, allergies and possible temperament problems. English Springer Spaniels need long daily walks and the opportunity to run and play off leash, as they need a lot of exercise. English Springer Spaniels may be headstrong, but are intelligent, learn easily and have a desire to learn. They are very enthusiastic.